An updated version of the perfect business shirt with a versatile and timeless design that works at any occasion. 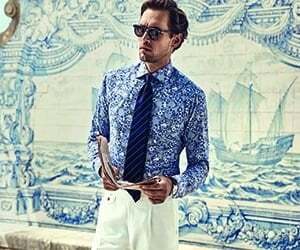 Fine details such as our vibrant floral print design inside the collar and cuffs add a personal look to your outfit. Crafted from our poplin fabric that combines elegant texture and flawless performance to stay crisp all day. Perfect to wear under sharp and traditional tailoring as well as under a contemporary suit.